These St Patricks Day Party Ideas are sensational! 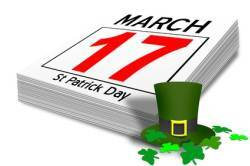 March 17th is St Patrick's Day. A day that honours St Patrick the patron saint of Ireland. Over the years St Patricks Day has become a festive holiday and celebration for Irish people and their descendants the whole world over. Key elements are parades, shamrocks, leprechauns and the wearing of green. Many also indulge in another Irish passion - enjoying a drink or three with friends. 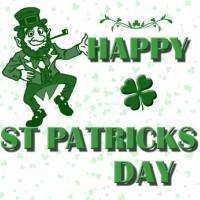 St Patricks Day however also makes a great excuse for a family or kids party. The Shamrock is an important symbol of any St Patricks day party as it is believed the saint used the 3 parts of the leaf to explain the holy trinity. A shamrock shaped invitation cut from green card therefore makes a great invite. You can buy shamrock shaped cookie cutters to draw around if you think your freehand might be a bit wonky. An Irish Limerick on the invite is a great idea too. Don't forget to tell all your guests to wear something green for good luck. Green and white are the colours for balloons, streamers and other St Patricks Day Party decorations. Four leaf clovers celebrating the "Luck of the Irish" and shamrocks can be cut from green card and posted around your party venue. You could also have them hanging from the ceiling. For a great centrepiece bring in the biggest rock you can find to make your own Blarney Stone. - This ancient stone when kissed brings good luck and the ability to talk and flatter someone until the cows come home - and have you ever met a true Irishman who was not full of such blarney?! Other traditions include pots of gold (containing the luck of the Irish) and snakes which St Patrick banished from Ireland. Green carnations or shamrock buttonholes are also needed for any guest who arrived not wearing green. Tradition has it that someone not wearing green must be "pinched" until they consent. Party games for St Patricks day do not have to be complicated. Many old favourites can be given an Irish makeover. Simply having Irish Jigs as your party music gives an Irish twist to things like musical bumps, chairs and statues. Line them up and give the first child in each team a pair of shamrocks. In turn the children have to head for the Emerald Isles (the mats) but treading only on the shamrocks. This means they have to move a shamrock each time to put their foot down again. You may like to make them struggle to do it themselves or for younger kids allow a helper to move the shamrocks for them. When they get to the Emerald Isle they jump on. The shamrocks are returned by a helper to the next person in their team who set out in the same way. Soon the Islands begin to fill up and the teams have to cling to each other to stay on which generally causes much hilarity. The winner is the first team to have all their team on The Emerald Isle. This is really an Irish version of a classic egg and spoon race. The difference is using big cooking spoons and that famous Irish staple the humble potato. The children must carry their "spud" on the spoon, without dropping it, along a course of your devising. You could do this individually or as a relay race between teams. Everyone knows four leaf clovers are lucky. And no St Patricks Day Party would be complete without a search for these elusive talismans. Hide small card cut-outs around the party venue and have your young guests hunt for them. They can then perhaps exchange any they find for sweets. Devise a simple contest whereby your young leprechauns have to leap the distance between 2 sticks. Increase the gap each time and continue until a winner is found. This is a lot more fun if you have a special pixie hat for the leaping leprechauns to wear as they make their jumps. Well who's to say its not common amongst the fairy folk of Ireland?! Have 2 adults hold a Limbo pole which all the young leprechauns have to limbo under to the rhythms of an Irish jig. "show the youngsters how its done!" All true Irishmen have a touch of "The Blarney" about them. St Patrick and all things Irish.